The following excerpt is from the second book of a two-book series on the person and spiritual children of Father Arseny. The book is called Father Arseny: Cloud of Witnesses, p. 148. In this passage Fr. Arseny speaks of his friend and fellow prisoner Fr. Seraphim, a holy hiermonk. I believe this image is pertinent not only for priests but for all Christians. Each of us in our own way ought to strive not only to cleanse our own souls from the dirt and mire of sin and the passions, but hopefully (through the grace of God!) serve as restorers of the purity of souls of those around us, to help direct others to the path of light. Through the prayers of the holy God-pleasing sufferers, Fathers Arseny and Seraphim may we also treat other human beings with the spiritual care and attention an icon restorer treats holy objects! As you can tell from the photographs, I like to keep my fingers busy with a little handicraft. About a year ago I finished the large cross stitch I was working on of the Three Holy Hierarchs (I wrote about this here). That was a pattern with the design already printed on the burlap. All I had to do was follow the colour scheme already in place. It took me about four years to finish it but it was a really nice craft. My stepmother bought me the pattern when she was visiting us in Greece. Shops in Greece had neat patterns for cross stitch, including a few icons. Once I finished the Three Holy Hierarchs I wanted to try to do create my own cross stitch patterns. Somehow I got the idea to try and do a small onion dome pattern as a book mark and before I knew it I had made many of them, in different colours and designs. Actually, now that I stop to think of it, my onion dome designs were initially inspired by photos of onion dome cookies. I then moved on to various cross patterns: Byzantine crosses (the three-barred cross) as well as a modified version of a cross pattern (depicted below) that was cross stitched on a small bag I have – done by the mother of one of the nuns I was close to in Greece. In fact, I keep my cross stitch materials in that little bag (I should have added a photo of it). These cross stitches I have done are all relatively small. The onion domes and Byzantine crosses were designed as bookmarks, as I said above. I’ve thought of making the square shaped crosses into magnets. When I figure out what I’m going to do with the surplus of bookmarks and magnets I now have, I’ll let you know. Perhaps we’ll start selling them at Lumination Press. In the meantime, I’ll keep stitching. “My son, if you want to make progress stay in your cell and pay attention to yourself and your manual work” -Abba Serapion (The Sayings of the Desert Fathers, p. 51). While our Orthodox Mission, Holy Lady of Vladimir, still holds weekend services at Queen’s College, this post is about our domestic chapel of St. Nektarios. I’m not a great photographer, but I wanted to show you how the domestic chapel of St. Nektarios looks now. I had written about our house chapel last year, but, to my great joy, we’ve made some additions. My father is a very accomplished carpenter and I had been telling him how I wanted him to make us an iconostasis for our domestic chapel. Because we didn’t have proper church furniture the icons I painted of Christ, the Mother of God and St. Nektarios were relegated to the side of the chapel instead of in front of the altar. So, I was in a hurry to have something made. The original plan was for my father to take measurements when he and his wife visited us in the Fall (of 2016). However, we ended up deciding on the spur of the moment, two days before dad was to leave, to build stands instead. Off we went to the hardware store to rent a table saw and buy supplies. While dad started on making icon stands from scratch with no pattern, his wife Angela and I went to the fabric store. She’s a talented seamstress and equally as enthusiastic about fun projects as my dad and me and so she thought she may be able to sew some coverings on my sewing machine while dad built the stands. I regret that there is no photo evidence of the state of my backyard while dad and I assembled the stands together: he sawing and hammering, me sanding and crack filling. (Fr. John would have been there to help but he got called away on a pastoral matter). It was a ton of fun and I was more than ecstatic about the way the chapel would look once we were finished. In short order the icon stands and the Proskimidi table were ready, the coverings were also ready. All Fr. John and I had to do was varnish/ stain the wood (which we’ll do in the summer – when we can do it outdoors), hang the coverings, and acquire gold crosses to be attached to the fabric. We were able to get the crosses during our trip to the mainland in October; we attached them with fabric glue, but we have yet to attach the large cross to the altar covering. There is still more to be done. I would like to buy three oil lamps to hang from the ceiling above Christ, Panagia and St. Nektarios. But, I’m trying to not be rash in furnishing the chapel, one thing at a time. I also plan to cover the large wooden candle stand with painted canvas like I’ve marveled at in Orthodox monasteries. (You can sort of see an example of a canvas-covered candle here; it’s to the right, in the middle of the smaller candles). This particular candle stand (shown below before the “Royal Doors” – or where Royal Doors would be) represents the fiery sword that prohibited entrance to Eden after the Fall. That is why it is placed here in front of the Royal Doors during the Divine Liturgy, after the consecration, while the priest communes. Words can’t express how grateful I am to have a chapel in my own home (something I always wanted). My gratitude is doubled by the fact that Fr. John has an Orthodox chapel in which to hold daily Morning and Evening Prayer, not to mention vigils. I’m a vain sort, but I’ll be honest and say that ever since my father built the icon stands and the chapel took on more of “chapel” look I try and make sure I never miss a Vespers service (I’m unable to attend Matins because of work). It’s a comfort to stand in the oil-lamp lit space and pray in front of icons that we have collected during our travels, and moreso in front of icons that I had the honour to paint. The icons I painted – pictured in the below collage – are as follows: (Top left corner) St. Gregory Palamas (he is to Christ’s right in the photo). Below that is an icon of St. Demetrios (this is a copy of an icon I painted – my godson has the original); Christ the High Priest and St. Nektarios (as well as the Mother of God depicted elsewhere); St. John Maximovitch (bottom left) – which I just finished last week; and St. John the Theologian (bottom right). It comes as a great consolation to me to have the icons I painted – icons that took me countless hours to paint – in our chapel. I can’t speak for other iconographers, but for me, when I paint an icon I don’t feel ownership over it. I may be a bit more critical of my own work than I would be of others, but at some point the icons I paint stop being my work and become the countenances of the persons depicted. And yet, I know each inch of the icons in intimate detail, they are so personal and yet so distinctly their own. It’s hard to explain, perhaps I’m just babbling. So, I’ll suffice it to say I’m deeply humbled that images I painted with my own unworthy hand now adorn an Orthodox chapel. I thank God for my talent and hope He accepts my offering. Lastly, I want to say while I love our domestic chapel, my joy would more than quadruple if our parish were able to establish a proper Orthodox church here on the island of Newfoundland. Amen, so be it. Please keep us in your holy prayers! In hopes of giving the children in our parish encouragement in their little prayer lives and a visible reminder of the beauty of Orthodoxy, these handmade prayer books were made with love. 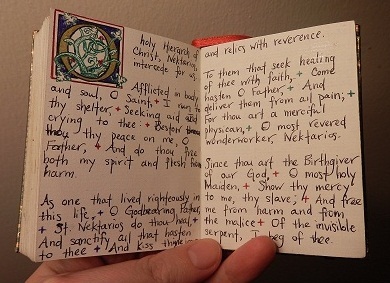 They’re inspired by illuminated manuscripts, just as the prayer books I make for myself are (you can view them here and here). 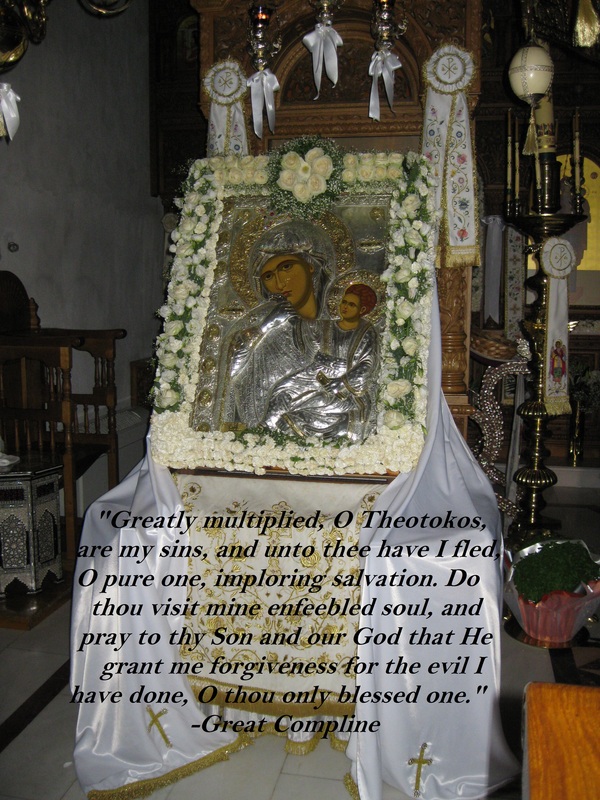 Each one contains prayers to the Holy Trinity, the Mother of God, the Creed, the Jesus Prayer and are customized to include the child’s patron saint and troparion (a prayer specific to that saint). 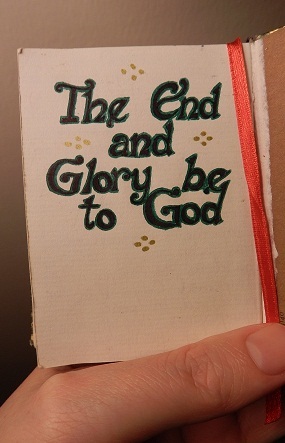 While I drew all the letters and the decorative border found on the last page, I wanted the children to participate in making their personal prayer books more beautiful. So, I included black and white icons for them to colour (I didn’t draw the icons – unfortunately, I didn’t leave myself enough time). I also left a blank space in the prayer “Through the prayers of [insert name of patron saint], Lord Jesus Christ have mercy on me” so they could write the saint’s name in their own handwritten script. Then I uploaded all the images I drew and spent far too long trying to format the little booklet on my computer. Once I had them all printed I wrote the name of the saint under the icons I had lamented and inserted in each child’s prayer book. The finishing touch was attaching a gold ribbon to each prayer book that my (beloved) husband cut and dipped in beeswax so they wouldn’t fray. Then I wrapped them all up and watched with delight as the children cautiously opened them after Divine Liturgy on Christmas morning. They were genuinely happy and a few of them didn’t even want to put them down while we broke the Fast with our annual Christmas brunch. I really enjoyed making the prayer books, and I hope and pray the children enjoy them too. Some print off the prayers they want to learn and cut them into small sections to keep in their pocket. When they are doing some of the more simpler jobs or tasks around the monastery they take out one piece of paper at a time and lay it in front of them. Then they say that section over and over again until they have it committed to memory. Afterward they take out the next piece of paper, adding another stanza or ode and so on until they have memorized the whole thing. Others will use small prayer books to do they same thing – taking them out to read when they get stumped. 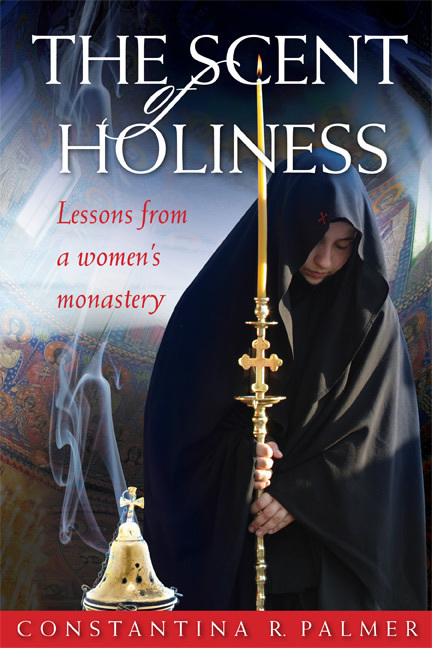 In the monastery there is always work to be done, rarely will a nun find herself idle. But in the world we are constantly waiting in lines at the grocery store, at the mechanic’s shop etc. And so, even if we don’t particularly care to commit a large prayer to memory, we can keep our mind occupied with prayer. 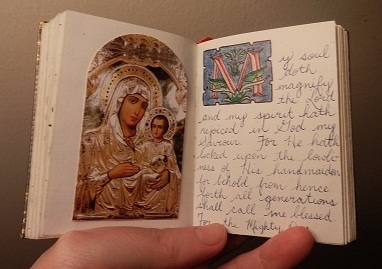 I wanted to memorize some prayers, so I took a tip from the sisters and made my own miniature prayer book. I thought writing out the prayers would help. So I that’s what I did. I keep it in my bag so that I have it wherever I go. When I’m on the bus or waiting for something I pull it out and read an akathist. 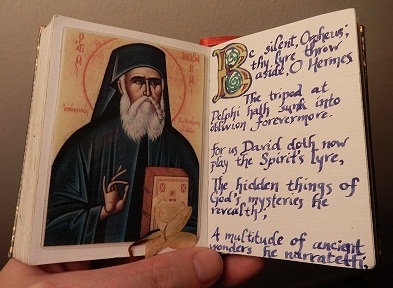 It only fits two akasthists and a few other favourite prayers but it is very helpful – mostly because it’s size makes reading the prayers in public somewhat discreet. 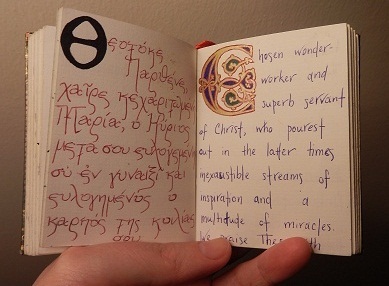 You don’t have to hand-write a prayer book, you could simply glue photocopies of prayers in a small book, or keep a larger prayer book with you. The point is to offer our attention – our nous – to God, to make an effort to “pray without ceasing”. I haven’t memorized any akathists yet, but I try to tell myself the point is to pray them, not accomplish something arbitrarily so I can feel self-righteous. And besides, I love an excuse to try and make something look pretty. 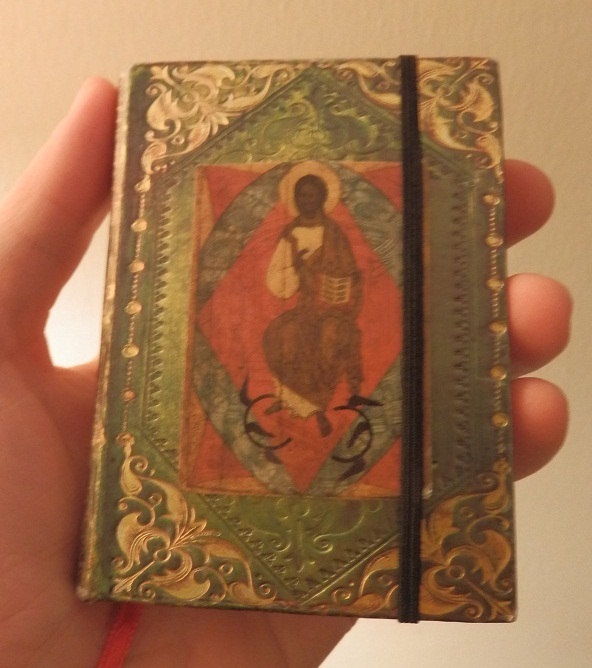 Having a notebook filled with prayers and icons and a little calligraphy makes the work worthwhile. 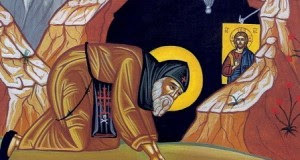 St. John Damascene accepted monasticism at the monastery of St. Sava the Sanctified and there bestowed his wonderworking icon [of the Mother of God of Three Hands]. The Lavra presented the icon “Of Three Hands” in blessing to St. Sava, Archbishop of Serbia (+ 1237, January 12). 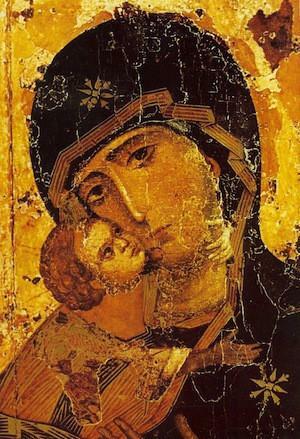 During the time of an invasion of Serbia by the Turks, some Christians who wanted to protect the icon, entrusted it to the safekeeping of the Mother of God Herself. They placed it upon a donkey, which without a driver proceeded to Athos and stopped in front of the Hilandar monastery. The monks put the icon in the monastery’s cathedral church (katholikon). 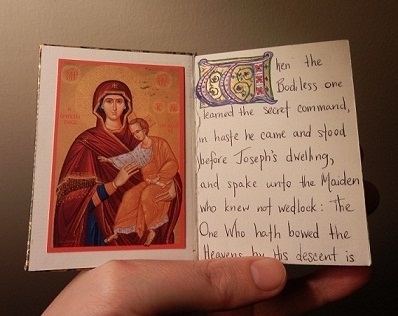 During a time of discord over the choice of igumen, the Mother of God deigned to head the monastery Herself, and from that time Her holy icon has occupied the igumen’s place in the temple. At the Hilandar monastery there is chosen only a vicar, and from the holy icon the monks take a blessing for every obedience. A Paschal candle decorated by my beloved nuns in Greece (it features an icon of St. Thomas placing his hand in Christ’s side).